To all of you who think there’s nothing better than chocolate, you’re wrong. To all those who think beer is king, you too are wrong. Why? Because both parties have clearly not been to Arbor Brewing Company to have the Chocolate Sesame Raisin Stout. That’s right, chocolate beer! To make things even better, it isn’t just any old chocolate. It’s copious amounts of artisan chocolate from Mason & Co., the craft chocolatiers from Pondicherry. The deep bronze stout comes with oatmeal, sesame seeds and raisins for that smooth finish. We love that the sesame adds a hint of nuttiness to the drink. If you’ve always been afraid of trying the stout because it’s strong, this might just be your opportunity to kick things off. After all, chocolate makes everything OK! To add to the indulgence, pair it with anything off their grilled section. We’d pick Spicy Pork Chops. Or even the Old School Drunken Chilli Chicken. For mains, have it with the fajitas. Better still, make it an all-chocolate affair and order Vertigo Chocolate cake. 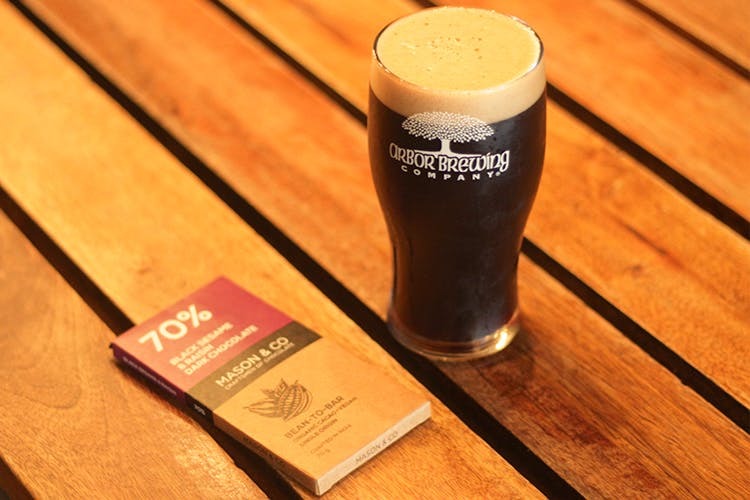 To celebrate World Chocolate Day, and extend that excitement for a week, Arbor is also playing host to Mason & Co. You can head to the brew pub for a open sampling session for the beer and divine artisan chocolate. The New Mocha Brownie Ale At This Microbrewery Blends Coffee, Chocolate And Beer! Have You Tried The Limited Edition Sour Beer At Arbor Yet?